I have been nominated for by some super sweet bloggers. Thank you! I am honored that you nominated me. I am sorry I haven’t posted it earlier. I received the “You make my Day Award” from Melanie Munchinger. Check out her newly released Stamp set called Just So Hoppy over at Gina K.
Silke Ledlow , Gabriela Arriaza , Beth Silaika and Jennifer Greco awarded me the E rating! 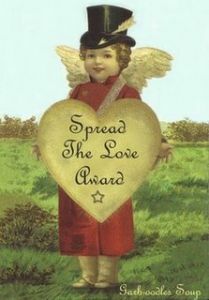 Leonie Schroder and Jennifer Weide gave me the “Spread the Love Award”. Wow, you’re popular! 🙂 And you deserve each award! You’re the best! You sure are the Beatestest and deserve even MORE awards! 😀 Ok…now I’m just getting cheesy with my Beate-words…lol. Cyber hug! You certainly deserve it, CONGRATULATIONS and huge hugs!!! TFS. Beate, I know that you’ve already been nominated for the ‘E’ award, but I just couldn’t resist posting a nomination for you just one more time — the details of which are on my blog. Thanks so much for continuing to inspire us all.